I had chosen to read Savage Wolverine on a monthly basis instead of the Marvel NOW! renumbered Wolverine. The savage version is enjoyable high adventure, while the Wolverine title seemed to be in the first issue to be typical Wolverine fair that I could pick up at my library as a trade. Then I saw the cover of Wolverine #3 with Nick Fury Jr. on the cover and everything changed. Since I assumed that was the first time that the two met I needed it. When I bought a copy of #3 there was also a copy of #2 sitting on the shelve and so I figured I would pick it up since I assumed it was a bridge in the story arc. Issue #2 is more than a bridge, it has Nick Fury Jr.! This issue continues the “Hunting Season” story arc which started in issue #1. 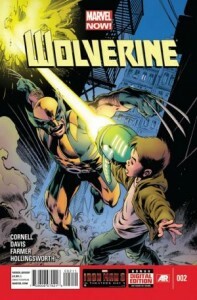 Wolverine is tracking a boy who is using an alien looking blaster to kill innocents and attack Wolverine. Logan attempts to balance the safety of innocent bystanders and avoiding causing the boy harm since Wolverine assumes that the boy is being mind controlled. In his efforts to track the boy, he is joined by Nick Fury. As the story concludes The Watcher enters, which creates the assumption that something cosmic is clearly occurring. So my big excitement was the hope of seeing the new Nick Fury meet Wolverine. With both Logan and the senior Nick Fury having histories that stretch back to World War II, I thought this would be fun. The sad thing is it appears that the two have already met before. However, their interaction still succeeds as Wolverine calls Fury, Nick Fury Agent of S.H.I.E.L.D. and Fury asks why Wolverine always refers to him that way? Is it possible that Logan is trying to convince himself? It is Wolverine that we learn the most about in this issue. Logan confesses that he currently does not kill out of anger. Yes, he can still kill. He will still kill. But his choice to kill is not currently guided by passion but reason. This is a very different Wolverine than the berserker that we are used to reading. Fury leads us to another point about Wolverine’s character. Being the Batman of Marvel, Wolverine is on every super team. He sells books. Fury asks which one of his teams he wants to have added to this case. Wolverine responds with none of them. He is fearful of what could happen if the telepath controlling minds got their hands on Thor or worse one of his mutant students. So yes Wolverine has a lot of teams, but he also cares deeply for his teammates. I admittedly tried Wolverine out and had walked away. The only reason I purchased this issue was the promise that Nick Fury Jr. would be include. Yes, I am disappointed this meeting is not a first. But I think Wolverine #2 improved on the debut and I will be back considering I know what is on the next issue’s cover (okay, I have already bought it).